Former NFL quarterback Colin Kaepernick donated $25,000 to a charity honoring Assata Shakur, a convicted cop killer and FBI Most Wanted List terrorist. Shakur, whose real name was Joanne Deborah Chesimard, was convicted of a 1973 murder of New Jersey State Trooper Werner Foerster, according to the FBI. Shakur was wanted for several felonies, including bank robbery, when Foerster pulled her over for a broken taillight. In the shootout that followed, Foerster was killed and Shakur was wounded. 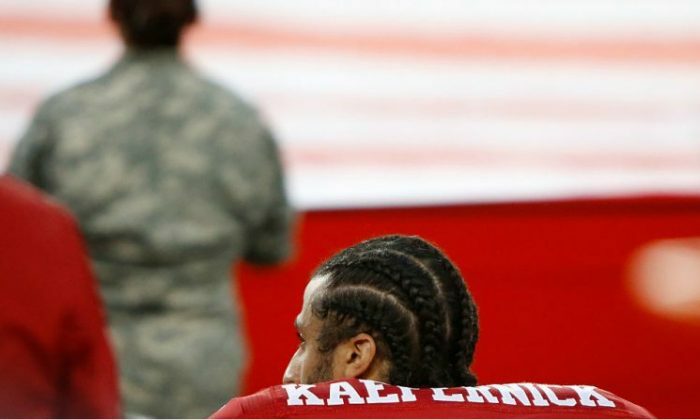 Kaepernick’s donation to Assata’s Daughters as part of a pledge to donate $100,000 a month for 10 months to “organizations working in oppressed communities,” the Washington Times reported. Kaepernick is a free agent football player who gained national attention for kneeling during the national anthem before NFL games when he played as quarterback for the 49ers. Shakur was sentenced to life in prison for murdering Foerster. She was a member of the Black Liberation Army (BLA), a violent socialist militant organization blamed for 13 murders of police officers and more than 70 acts of violence in the 1970s. In 1979, members of the BLA visited Shakur in prison with concealed guns, took prison officials hostage, and broke Shakur out of jail by escaping in a van. Shakur then escaped to Cuba and remains there today. Assata’s Daughters said its overall direction is to “escalate, deepen, and sustain the larger Black Lives Matter movement.” The Black Lives Matter movement has often been criticized as being anti-police. Kaepernick was the first NFL player to sit for the national anthem starting in August last year. After a nationwide backlash from fans, he began to kneel during the anthem instead but never stood again. The quarterback said that he took a knee to raise awareness for racial injustice and police brutality. Kaepernick opted out of his contract with the 49ers in 2017 and remains a free agent. Kaepernick’s donation comes to light after a week of national anthem protests by hundreds of NFL players. The surge in protests was triggered by President Donald Trump who said that players who kneel during “The Star-Spangled Banner” should be fired from their teams. Assata Shakur was the godmother of rapper Tupac Shakur, whose father was convicted of helping her escape prison. She remains on the FBI’s Most Wanted List for domestic terrorism, murder, and fleeing prison.